Yamaha NS-SW700 review | What Hi-Fi? 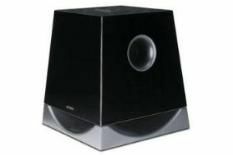 This subwoofer usually resides in Yamaha's £2200 NS-700 surround speaker package. But it's available as a standalone unit, too. The rear-ported NS-SW700 features a 25cm downward firing cone and a 300W internal amplifier. The quirky trapezoidal design compares favourably to the more common, but duller, ‘boxy' units we usually see. Conveniently situated on the top of the sub are controls for volume and frequency crossover. There's also a button that allows you to switch between music and movie mode. In the latter position, it appears to highlight the edges of the very lowest frequencies, and thus gives a greater sonic impact. Revert back to music mode, and the Yamaha produces a more even-handed delivery. And, overall, the 'SW700 fares very well. It produces a solid, taut sound and doesn't flap around: low frequencies hit with precision and confidence, and you have to push it extremely hard before it exhibits any signs of bottoming out. We'd just like a little more agility and a greater feeling of freedom to the delivery of bass notes. They don't bound along with the same sense of enthusiasm as they do when heard through class-leading subwoofers at this price. If you partner the 'SW700 with Yamaha's optional SWK-W10 wireless kit (£150) you can wirelessly connect the sub to one of Yamaha's Air-Wired soundbars, such as the YSP-4100. In theory this is all well and good, and in practise it's very convenient and easy enough to connect the two. However, the sub doesn't sound as driven and determined this way. We found it sounds better when hooked up with a quality subwoofer cable. If your system's sounding a little bass-light, then the NS-SW700 is worth investigating – it's a solid performer.